Your support has brought new recognition to the NP role! Every year, AANP is honored to celebrate the 270,000 NPs in the U.S. during NP Week. From special events at health care facilities across the country to spotlights on outstanding NPs and letters to the editor, your continued support for and dedication to the NP role is making a difference in the lives of your patients and in the health of our nation. That’s why, in addition to showcasing NPs to the public, NP Week is an opportune time to help educate lawmakers about the benefits of NP-delivered health care. 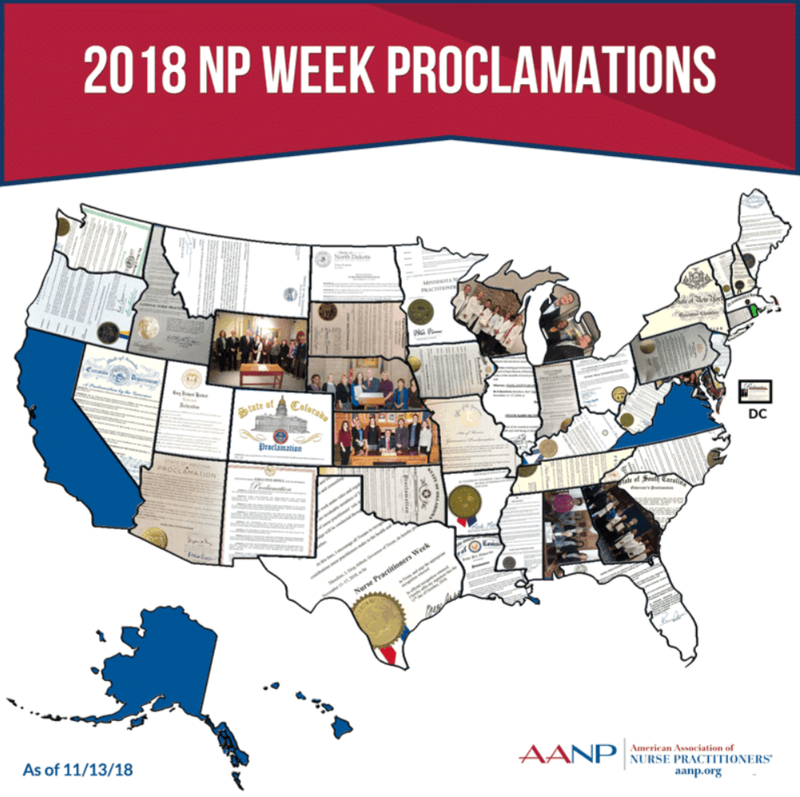 The NP Week proclamation is available each year for your local or state officials to sign in recognition of all that you do and the quality care you provide. In 2017, proclamations were signed by governors in 44 states, recognizing NPs as trusted front-line health care providers who hold advanced education and clinical training. This year, we are pleased to announce a new record number of proclamations were signed! This NP Week 2018, AANP received proclamations from 46 states and the District of Columbia. We look forward to reaching all 50 states and U.S. territories in the future! Thank you for celebrating with us, and special thanks to AANP state representatives and others who worked diligently to collect proclamations and educate the public about NPs. AANP is grateful for the opportunity to bring attention to your work and will continue to share the need to remove outdated barriers to practice so that NPs nationwide will be allowed to practice to the full extent of their experience and education. NP Week 2018 is over—but our work never ends. Build upon your NP Week success every week throughout the year! Stay informed on legislation that impacts your practice and get involved at the AANP Advocacy Center. Was your state not included on the NP Week Proclamation Map this year? Start planning for NP Week 2019 with our 2018 NP Week Resource Guide.